Your name was randomly drawn! So pick out which of the books from my January bookshelf you'd like, email or Facebook me your address, and I'll mail it out to you:) Congrats! Now onto today's Bookshelf Friday pick. I've actually had this book for quite some time thanks to Netgalley, but it only recently released for purchase. I deliberately held my review until this book was available. Here's the blurb, and we'll chat on the other side! 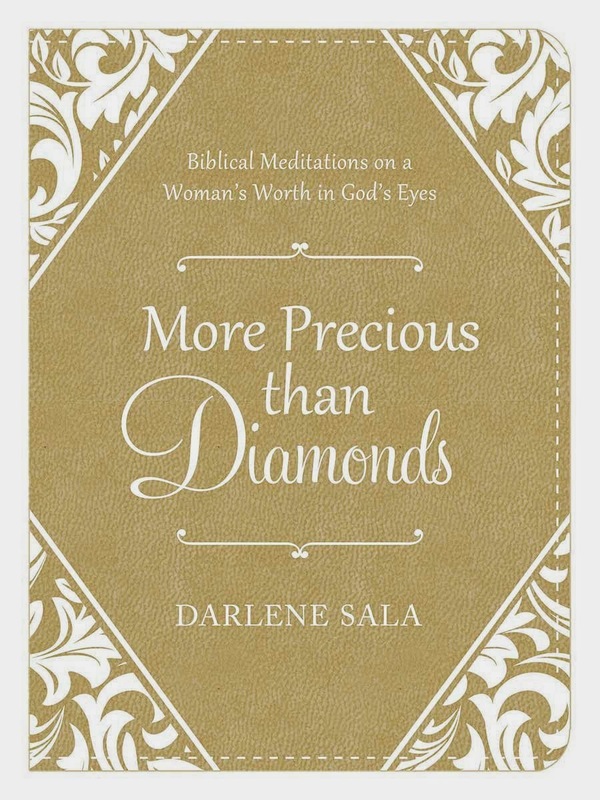 “More precious than diamonds” is how God views His daughters—and how popular author Darlene Sala wants women to see themselves. These long-form devotions—always affirming and occasionally challenging—will remind readers of the value God places on all people, but especially women; point them to the resources God offers for women; and urge them, as valuable in God’s sight, to live their lives to their fullest potential. Darlene Sala’s previous books have sold a half million copies—women clearly appreciate her inspiring message, which continues in the brand-new More Precious Than Diamonds. I mentioned above how I've been holding onto my review for this book until it was available to purchase, and that's because I so loved this book I wanted to know people had immediate access to it. As you know this year I'm really focusing on our worth in Christ--a message that's been important to me for years. However, as God was reawakening my passion last Fall for this word, More Precious Than Diamonds wound up on my Kindle. Perfect timing. But it's God, so why am I even remotely surprised? With encouraging words, relatable stories, and impactful verses, Darlene challenges us to see how valuable we are. That we were created with a distinct purpose and plan by a God who loves us immeasurably. Each day was a gentle nudge to grasp this understanding along with specific verses to fortify the belief. Because we are...you are...created by a God who values you more than any other creation. Who measures your worth in unquantifiable means and finds you as cherished. Loved. And so much more precious than diamonds. I never would have discovered this book on my own. Thanks for sharing!